Flyer is a software platform helps you avoid redundant tasks by centralizing all your listing data in one place. 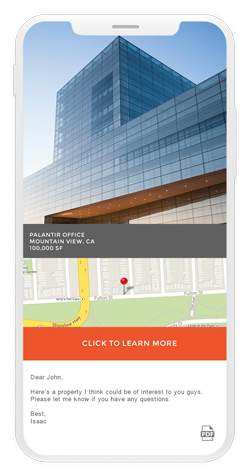 Simply add or update your listing information into Flyer and it’ll be automatically synced and distributed throughout your commercial real estate marketing materials - including Flyers, email blasts, listing sites and interactive maps. There’s no need to create each collateral separately, Flyer will take care of that for you. You’re unique and so is your brand, Flyer takes your company’s collaterals and it automatically populates them with the listing information and media you provide. Keep your marketing organized and brand consistent. Do it all in one place. Create and update all your marketing without leaving Flyer. Generate a listing PDF in seconds with one click. Reach your clients in three easy steps. Automatically updated every time you modify or add a new property. Showcase your listing’s value by pin-pointing its location. Never use the same template as your competitors. Our team takes your company’s PDF, replicates it, and puts it in the platform. We know your brand is unique so we make sure your PDF looks and feels like your firm. Flyer complements mailing tools like MailChimp and Constant Contact to help you do more with your marketing. Just like our PDF flyers, email templates are custom made to fit your brand. Easily create email blast campaigns to reach your clients. Mobile-friendly websites for each one of your listings. Clients like to see your properties before they schedule a tour so we fully equipped each listing website with a photo gallery, 360 imagery, aerials, layouts, videos, PDFs - you name it! Your listings are ready to be seen and shared. Location, location, location! Showcase your commercial real estate listings with an interactive map. Have the ability to pick and choose search filters that work for your listings. Display points of interest nearby. Take advantage of the tools designed to fit your needs. Checkout an overview of all the tools that Flyer provides for your brokerage marketing needs. Still not convinced? Schedule a call to answer all your questions.